He was the son of one wealthy man, Hiram C. Cable, and the nephew of another, Philander Cable, yet Ransom R. Cable started his working life as a railroad conductor on what would become the Rock Island and Peoria (RI&P) Railroad. Although the line went only as far as Coal Valley at the time, it was far enough – the iron in Ransom Cable’s blood was already shaped like rails. As the railroad prospered hauling the coal from nearby mines, Ransom advanced in the company, soon becoming its general manager. When the mines were depleted, Ransom extended the railroad lines to Mercer County and a new coal town called, appropriately, Cable. He eventually purchased the RI&P. And he invested in the larger Chicago, Rock Island and Pacific (CRI&P) as well, ultimately becoming its president. Ransom’s involvement extended to other railroads, as well, notably the Burlington, Cedar Rapids, and Northern and other smaller Iowa roads. Although his railroad interests required Ransom to travel throughout the country, he still called Rock Island his home. When he died at age 75 at his Chicago house during a trip there in 1909, his funeral was held from his Rock Island home. 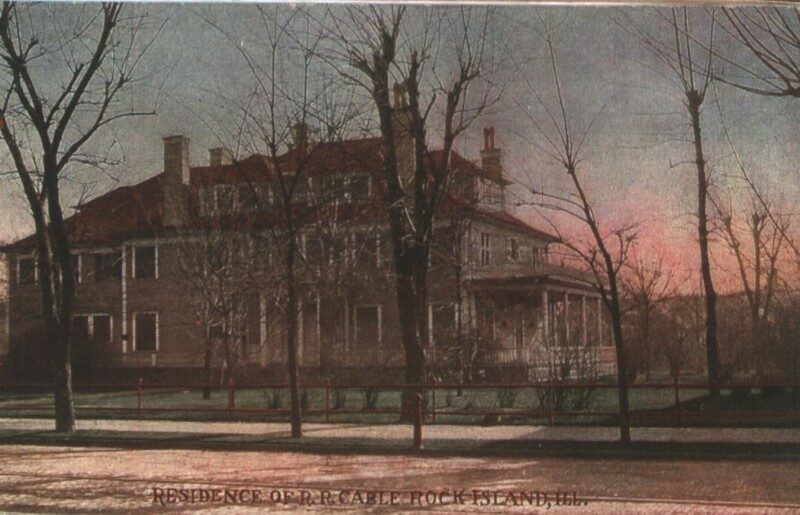 That wood frame home at 918 Second Avenue is pictured on this postcard. It was built during the 1890s, perhaps replacing or greatly expanding an earlier home at the same location. The postcard view is from Second Avenue, looking slightly to the southeast. What appears to be a wide front porch on the right is actually a side entrance; the main entrance is from the smaller round porch near the center of the house. The Cable house is distinguished because of its sheer size. It was nearly double the volume of nearby homes – and they were not small. Its site was nearly one quarter of the block with frontage on two streets. His Chicago home was designed in the Richardsonian Romanesquestyle in 1886 by prominent Chicago architect Henry Ives Cobb of Cobb & Frost. Since 1994 it has served as the headquarters of Driehaus Capital Management LLC. Richard Driehaus is a major contributor to the historic preservation movement in Illinois. After Ransom’s death, his second wife Jane moved to their Chicago home. Their son Hiram S., who had lived next door at 914 Second Avenue, took over his father’s house for a short time, then moved to a new Prairie style home he had built at 19th Avenue and 15th Street in 1912. By 1920, Ransom’s house had been converted to Avalon Apartments, with 18 units – it was a big house! The apartment use continued until 1963, when 142 buildings, including this one, were razed for a new expressway and something called “urban renewal.” A very few houses were saved during this demolition spree, Hiram’s among them. It was moved to a steep lot at 28th Street and 8 1/2 Avenue where it stood until recent years before it was demolished. This article by Diane Oestreich is slightly modified from the original, which appeared in the Rock Island Argus and Moline Dispatch on April 7, 2002.